Zou-roku - is a relatively new ramen store produced by the famous ramen personality Watanabe-san, who is also the owner/creator of 渡なべ in Shinjuku and 瞠 (Miharu) in Shibuya. This day I ordered the 味玉醤油らぁめん (shoyu ramen with flavored boiled egg). The Soup - first impressions are that this soup is seafood based, but after a sip of the soup the flavor is so rich and thick that I had to pause to figure out what was going on. There was the distinct rich texture of tonkotsu soup, mixed with the aroma of seafood (bonito and dry sardines). 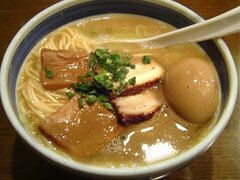 After some research later I found out that the soup is prepared separately in three parts, tonkotsu (pork bone) based, chicken based, and seafood based, giving it a really complex personality. The Noodles - are thin, straight noodles, cooked rather firm. The springiness of the noodles are strong, but the flavor is quite subdued. The Toppings - are very good. Large sliced of cha-shu pork, menma bamboo, and the boiled egg's yolk is half cooked and so full of flavor. The flavor of the cha-shu and bamboo is toned down a little bit. Overall - The craetor of this ramen wanted the soup to be the center of your attention, keeping the noodles and toppings subdued and the visual presentation simple. While I enjoyed the ramen quite a bit, I feel that I need to eat here a few more times until I can figure out whether I like this place enough to return regularly. I have simply never had ramen soup that tastes like Zou-roku's. Zou-roku is located right outside Shinagawa station in Tokyo (take the Takanawa exit). mm, this is an awesome blog.